In order to slowdown the inland move of the dune, some important planting work was done within the “Gaillouneys” sector during the winter (This is the South part of the Dune, starting from Bunker on the beach). As a result, the paragliding activities are impacted in that area. Out of the two bowls of “Gaillouneys” that used to be compatible with paragliding, only the lower part of the West Bowl (Combe Ouest) remains usable for takeoff and landing. The other areas have been “vegetated”. The Oyats plants (Dune Herbs) are extremely sensitive and should absolutely not be stepped on at younger age. If we can be confident that most of paragliding pilots will pay attention to these areas, it is to be feared that in the summer rush, a minority might not comply with the restrictions, resulting in site destruction and in bad relationships with the official authorities managing the site and putting its usage at risks. The lower part of the West Bowl is quite technical and is used heavily by professional tandem pilots. The narrowing of the usable space will increase the incident risk level. Thus, in order to both improve security and plantation protection, it is recommended for less experienced pilots to fly preferably the “Grande Dune” area. Please find here the pictures. 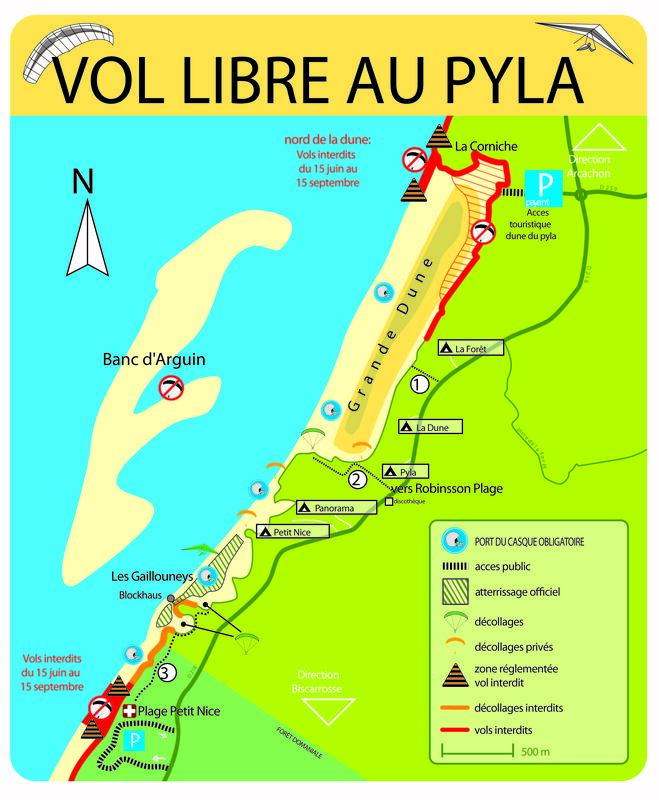 Welcome to the wonderful paragliding site, the “Dune du Pyla”. Here, you will learn what wagas mean, as well as soaring along the beautiful and marvelous sand coast, for long hours. But don’t forget we need your help to maintain this site, accessible and enjoyable for all paragliders. Thank you for visiting us, and we wish you a pleasant flight ! Outside this period, it is allowed to flight in the north, up to 100 meters from “La Corniche” houses. Flight over Arguin sandbank is totally forbidden. This site is classified as Natural Reserve. Don’t forget your speed bar ! The wind can grow up fastly, and trap you. Don’t hesitate to have a look at the sea and the sky, it will warn you about a possible wind strenghthening. It is strongly recommended to wear shoes : the sand hides some sharp objects, as broken glasses (and by the way please do not litter). The site is particularly crowded in summer period : please, respect the paragliding priorities, as well as security distances. Ensure your path is clear before making the turn. The site is classified in a protected natural area: its balance is weak.